Discovering secret places of the French Riviera and of course the very well known ones. The department of the Alpes Maritimes is in the south east corner of Provence, France and is best known for being home to some of the trendiest coastal resorts in France such as Nice, Antibes and Cannes. You can see these popular resorts in our Cote d'Azur region guide, along with Roquebrune-Cap-Martin and Cap-Ferrat and other coastal resorts such as Mandelieu-la-Napoule and also the principality of Monaco. But there is much more to the Alpes-Maritimes than the Riviera, and time spent exploring inland will introduce you to a different world, a countryside of great beauty and breathtaking landscapes and views, often far from the crowds that line the coast just a few kilometres to the south. Places to visit in Alpes-Maritimes The Alpes-Maritimes department can perhaps best be seen as falling into three main 'sections'. First is the coastal region, largely built up and busy, and containing some of the most beautiful coastline and most popular beaches in France. This strip occupies perhaps the ten kilometres most close to the coast. Heading north comes the start of the low mountains, and the smaller towns and villages that typify the region. Roads become dramatically quiter (and often narrower!) as you enter the impressive rock, forested scenery of the region. Some of the villages and towns that should feature during your visit to this part of the Alpes-Maritimes include: Biot, inland from Antibes; the 'most beautiful village' at Gourdon; the 'art and restaurants' town of Mougins, perched village where Picasso spent the last years of his life; the perfume town of Grasse and the nearby perched villages at Tourrettes-sur-Loup and Bar-sur-Loup. The town of Valbonne, now closely linked with the technological region of Sophia Antipolis, also has an interesting historical core while the nearby tiny village of Opio also deserves a visit. West from Nice be sure to visit the historical centre of Vence, the beautiful village of Saint-Paul-de-Vence, and the nearby art museum at Fondation Maeght. North from Nice there is a fascinating variety of ancient perched villages each with their own particular charm (and views across the landscape): Eze, La Gaude, Saint-Jeannet, Falicon, Colomars, Aspremont, Castagniers, Tourrette-Levens, Saint-Blaise, La Roquette-sur-Var, Levens, Coaraze, Duranus Further east towards the border with Italy visit see Sospel then head into the Roya Valley to visit the hill towns of Saorge and Tende and the Valley of Merveilles. Finally, the third region is the more mountainous northern half of the department, usually beyond the reach of 'day-tripper' tourists and offering a great range of magnificent scenery. This includes the extensive Parc National de Mercantour, and a very wide range of possibilities for those seeking an active holiday - see outdoor activities in the Alpes-Maritimes - including hiking, mountain biking, caves, rock-climbing, hang-gliding, kayaking etc etc. This village is known to keep the charm of Provence and the prestige of the Riviera. 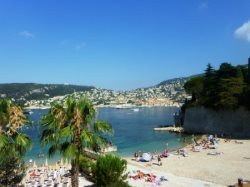 Villefranche benefits from a mediteranean climate; mild in winter and hot in summer. Nestling in the heart of one of the most beautiful roadstead in the world, Villefranche sur-mer welcomes you in his haven of peace. Created in 1295 by Charles II d’Anjou, the village kept its picturesque charm with the passing centuries: the warm colors of the mediteranean façades, the small steeped streets of yesteryear appearance, its citadel, and the rare works of Cocteau, Volti or Goetz are some of the treasures you will discover in this village as foretaste of paradise! Your arrival in port of call of Villefranche is right in the heart of the medieval city (history) and it will be your starting point to discover Villefranche-sur-mer and the French Riviera. In order to discover Villefranche and the French Riviera, several means of transportation are at your disposal. The oldest places of inhabitants of Eze go back to the neolithic era towards 2000 BC on the Mount Bastide. At the iron age, the celto-ligurians population who lived in this area erected many castellaras along the coast. These constructions were built with dry blocks of stone and were generally heighly located. The one on the Mount Bastide dominates at 567 m above the sea level and it is one of the best preserved of the region. The city and surroundings were occupied by the romans and the gallo-romans. With the arrival in the village of prince William of Sweden and the musicians Balakovic and Barlow in the "années folles", everybody was charmed by the luminosity and the majesty of the place just like George Sand and Friedrich Nietzsche. The commune timidly opens his doors to the tourists. Eze sea side, served by the railway, develops safe from a pine forest (PROFOUND!!). Artists and craftsmen settled in the village. Eze sur Mer somehow manages to avoid crowds and maintain a peace and serenity, for a romantic stay, or a family vacation. Jealously protected by two hills, in the east by Balzan Castle, in the west by the Madrid Castle, Eze on the Sea is well known for its calm and quiet atmosphere. Sheltered from the swell by the peninsula of Saint Jean Cap Ferrat, Eze takes advantage of the microclimate for a luxurious mediterranean vegetation. The alleys called Cigale, Oeillets and Provence reveal the kindness of the climate and the gentle way of life. The pink facades and ochre of villas in the middle of a luxurious vegetation where there are bananas trees, stand out against the blue sea. The wistenia, jasmin and the bougainvillea extend beyond the barriers and portals. The lemon trees, bigaradier and mandarine trees which give the famous small mandarine of Eze, perfume all the paths. Eze sur Mer is the ribbon of seaside that belongs to the towering perched village of Eze, which looms so close and yet so distant. It is very common in this part of France, famous for it's lofty ancient towns, for the mountain top villages to have a corresponding stretch of coastline. This came about when fishing and farming on the lower lands was imperative to the survival of the townsfolk. Eze sur Mer is one of the most accessible places on the Cote D'Azur as the rail, road and bus links all run along its length, providing a dividing line between the mountains and the sea which protects the beach beneath and creates a gentle peace. The town is split in two, encapsulating the best of both coastal and mountain worlds so whether visiting the seaside part or the heart of the old town on the hill, Eze offers a rich culture mixed with local traditions and an elite, luxurious lifestyle. The magical and unique ambiance of the town will envelope you at every moment. But perhaps no one was more charmed by Eze than Frederick Nietzsche. Though he spent only a short holiday in the area in the 1880.s, the environment had a profound tonic effect on the famously troubled philosopher..I slept well, I laughed a lot, and I found a marvellous vigour and patience, he later recalled. He also found the inspiration for the third part of Thus Spoke Zarathustra, much of which was composed in his head while hiking the steep trail from the seaside to the medieval village. The route is now known officially as Le Chemin de Nietzsche: Nietzsche.s Path. Winding up a forested ravine, the quiet trail lends itself naturally to contemplation. Birds chirp. Leaves rustle. The gravel path crunches below your feet. The sea washes below, beyond the scent of pines. Here, the decadent beach clubs and loud night spots of the teeming Riviera resorts are as immaterial as the low clouds drifting past. When the going gets strenuous, try repeating Zarathustra.s mantra from his own sojourn through the mountains: You are treading your path of greatness. No one shall steal after you here. Nice is a city of paradox, audacity, discovery and pleasure. A symbol of the Mediterranean art of living, it offers a perpetual invitation to travel. Its vicinity, too, provides ample opportunity for architectural and cultural discoveries, from pleasant strolls in museums to old palatial homes, from beaches to gardens and gastronomic adventures with countless flavours. The sheer Rock of Monaco and its natural harbour have been the source of bitter struggles since earliest antiquity. The Ligurians were the first to make their home there, followed by the Romans and the Barbarians. It wasn't until 1297 that the Genoese Grimaldi family claimed Monaco, beginning a dynasty of Lords and Princes that has lasted over 700 years. After gaining independence in 1489, Monaco was placed under the protection of Spain in 1524, France in 1611, and finally, Sardinia from 1815 to 1860. With the founding of “Monte Carlo” on the Spélugues Plateau in 1866 and the opening of a railway in 1868, the Principality embarked upon a period of great development, becoming an ultra-modern state and playing a key role on the international stage. The Principality of Monaco may be one of the smallest countries in Europe, covering only 195 hectares (54 acres), but since 28 May 1993, it has been a fully fledged (183rd) member of the United Nations, and is involved in close to a dozen other specialised institutions. Saint Jean Cap Ferrat Situated only 10 km from Nice and Monaco, Saint Jean Cap Ferrat, “Presqu’île de rêve”, has become known worldwide and offers its visitors the charm of a delightful and well preserved area 282 hectares peninsula is a charming and well preserved area. A real oasis on the Côte d’Azur and an ideal holiday destination, with more than 300 days sunshine per year. Beaches and paths by the seaside provide delightful walks passing luxurious villas and magnificent gardens. The Saint Hospice Chapel, the Ephrussi de Rothschild Villa-museum and numerous “Belle Epoque” villas reflect the cultural and historical past of the site. Family destination on French Riviera Today Villeneuve-Loubet has become a real family village for holidays, with a lot of possibilities of sports and leisure activities open to children and teenagers. The Mediterranean Sea offers the pleasure of swimming but also a lot of water activities, often open as soon as the children know how to swim. St-Paul-de-Vence is small, and also one of the most beautiful and most visited villages in France. It is best summed up by the sign at the entrance to the village itself which reads 'authentic and touristy, quiet and buzzing, Saint-Paul is proud of its paradoxes - they are the key to its charm and identity'. I certainly couldn't put it better myself! A beautiful perched village of Provence, it has attracted many artists during the last century - starting with Modigliani on the 1920's - and now has a very high reputation as an artistic village, and as a place of great natural beauty. Picasso, Braque and Miro are among the other well known artists who stayed at St-Paul-de-Vence. This legacy continued into the 1960's when the village was host to many renowned French film actors and directors. Many of the artistic community, when less well known, stayed and eat at the Colombe d'Or hotel - which frequently accepted works of art as payment in kind, and now has one of the finest private art collections hanging on its walls! The village itself is entered through an original stone gateway through the defensive ramparts (16th century), then consists of one 'main' (narrow and cobbled) street that runs from one end of Saint-Paul-de-Vence to the other, with a couple of small side-streets to also explore and the chance to enjoy the views over the surrounding countryside and the many attractive medieval houses and attractive facades - be sure to pay close attention to the houses and try and spot some of the statues niched within the walls. Not surprisingly there is a large number of cafes, boutiques, and especially art and craft shops so you can take your own piece of St-Paul-de-Vence art home with you. The 'art connection' of the town means that a very high quality of art gallery are to be found here, especially along the first section of the main street and art enthusiasts will take great pleasure in window-shopping. At the far end of the village is a belvedere where you can best appreciate the views, and also the cemetery where the artist Marc Chagall is buried. Note: busy even by the standards of 'beautiful Provence villages' it is said that more than 2 million visitors come to Saint-Paul-de-Vence each year. This is a lot for a small village! Do try and get here very early... This artistic legacy has given rise to an especially fine art museum on the edge of the town, the Fondation Maeght. The modern art museum (founded by a family of art dealers from Cannes) features an exceptional collection of painting, sculptures and artworks of the 20th century - the areas featuring Miro sculptures and Giacometti sculptures in natural settings are among the many highlights. Cannes, the city that has an international reputation for glamour - pictures and movie clips of its croisette, welcomes you in the world of style and sophistication. The south of France benefits from a Mediterranean-type climate, characterized by exceptional sunshine almost 300 days a year and mild temperatures for most of the year. Discover a beautiful city, famous all over the world. Passion for the sea, the mountains or the city? The south of France has it all. Either through adventure or relaxation, choose the simple or the luxurious for your holidays in the south of France. Cannes is located in the heart of the French Riviera, on the Mediterranean coast. Since the end of the 19th century, and perhaps even more so than any other Cote d'Azur town, Cannes is associated with the rich and famous and the glitzy - in part due to the prestigious annual Cannes Film Festival ensuring that the city name is broadcast to every home in the western world along with a list of glittering celebrities photographed in the sunshine with a palm tree backdrop. The image is not far wrong - Cannes does attract the jet-set and the rich and famous, and the city reflects it. In reality there is perhaps slightly less to see and do - beach and expensive bars and restaurants aside - in Cannes than in some of the other Riviera resorts, but the chance to walk in the footsteps of your movie heroes helps to compensate... In fact despite the bad press given to Cannes in many guide books we thoroughly enjoyed it. Places to visit in Cannes Situated along the sea edge the sea edge the harbour glitters with the reflections of the sun from the many yachts harboured here. Walk a bit further along the coast and you are on the famous Boulevard de la Croisette. The Palais des Festivals - location of the Cannes Film Festival is on one edge of the boulevard and you too can have your photo taken on the famous steps of the Palais. Unfortunately they hadn’t rolled out the red carpet for us! On the floor nearby are the tiles with the hand prints of famous stars such as Clint Eastwood and Bruce Willis. Continue down the ‘la Croisette’ and there is a long sandy beach, though much is taken up by private beaches belonging to the expensive hotels on the other side of the ‘Croisette’. All along the boulevard there are lots of designer shops interspersed amongst the hotels. Behind the ‘Croisette’ is the Rue d’Antibes which also has an amazing concentration of designer shops. It is a wide and pleasant street and a lovely place for a bit of window shopping. There are a lot of more affordable shops here too. Back beyond the ‘Vieux Port’, the ‘old port’ and harbour walk steeply upwards and on to the hill known as Le Suquet. On the summit are the remains of a priory and the Chapelle St Ann - now home to the Musée de la Castre. The views from here over Cannes, and the harbour and beaches are fantastic. Behind the back of the old port the 'Allées de la Liberté' is an attractive open space where the Cannes flower market is held. Keep drifting west through the old town to the main market - Marche Forville - and narrow streets lined with boutiques full of things you can't afford. From Cannes you can take a 15 minute ferry ride to the lovely Isles de Lerins. One of the Isles - Sainte Marguerite housed a prison where the ‘Man in the Iron Mask’ was locked up! Just next to the infamous riviera city of Cannes, with its red carpet and irresistable celebrities, is Antibes. Though the city may be lacking in international film festivals like the one that draws millions 20 minutes away to Cannes, Antibes has nevertheless become a destination for countless tourists as well as retiring Brits looking to take advantage of the sun and sand. Especially in the spring and summer, the Mediterranean weather and sunlight makes it a perfect place to spend the warmer months. ...but it's worth it. Today, the demographic in Antibes varies greatly from that in Cannes. During the film festival, Cannes is filled with stars, but during the year, most of the people who take residence in Antibes' neighbor city are native cannois. Not so in Antibes, where the demographic is made up of people, mainly from the British Isles, who have purchased a second home in the city. This demographic has turned the city into a very luxurious place all year round, and most of the boutiques in the city center cater to those looking for haute couture. The entire city has a constant feeling of glamor about it that is impossible to find in any other city on the riviera. Like Cannes, Antibes is characterised by sandy beaches: beaches on the Mediterranean are usually rocky, and it is only in cities like Cannes and Antibes that man-made sandy beaches allow tourists to truly enjoy the pastime of laying in the sun. The Plage de la Gravette in Antibes is one of the oldest in the city, and while it can get a bit crowded, especially in the peak season, it is a very safe and pleasant beach with a westward facing shoreline allowing for perfect afternoons spent in the sun. Many riviera cities grow famous for their proximity to the Mediterranean, and their cultural aspects are overlooked. Be sure not to do this in Antibes, where there are many things to see and do, one of which is the wall surrounding the city that dates from the Roman Empire. This fortification was built when Antibes was a strategic city for the Roman troops, directly across from the major city of Nice. Roquebrune-Cap-Martin is a coast town on the Cote d'Azur, between Menton and Monaco in the south-eastern corner of France. In the early decades of the 20th century Cap Martin was THE place to go and be seen, a hangout for the rich and famous of the time. This pretty medieval village, overlooking Cap Martin, has lovely narrow streets to explore winding between beautifully restored medieval houses. Some of the narrow passageways are vaulted and covered, adding further to the enjoyment of an exploration. Roquebrune-Cap-Martin is perhaps best known for its castle - built in the 10th century to keep the saracens out - and the castle donjon, thought to be the oldest in France. Much of the castle we now see was added later by the Grimaldi family, once very powerful in the region. (There is also an ancient olive tree here that is said to be one of the oldest in the world). There is a good coastal walk along Cap Martin that starts from just below the village and is named after the architect Le Corbusier who drowned here in 1965. Cagnes-sur-Mer is found on the French riviera between Nice and Antibes. Cagnes really consists of three separate parts: Cagnes-sur-Mer, the seaside resort; Cagnes town just behind the resort; Haut-de-Cagnes, the original settlement on the hill behind - it is the village at the top of the hill that is most interesting, standing as it does in the location of an earlier village occupied in turn by both the greeks and the Romans. The old village of Cagnes - called Haut-de-Cagnes - has plenty of old narrow lanes and stairways to explore, lined with medieval and renaissance houses, but it is the castle for which it is best known. Chateau Grimaldi Chateau Grimaldi was once the most important centre in the region, when the Grimaldi family were all rich and all powerful, and dates from the 14th-16th centuries. Squat and very strong looking, the chateau contains some very interesting highlights, including a stunning internal courtyard with lovely galleries, a fine staircase, a monumental fireplace and an elaborately painted ceiling - dating from the renovation of the castle in the early 17th century that transformed Chateau Grimaldi from fortress to comfortable living space. Not surprisingly the views from the castle tower out to sea are very impressive. The Mediterranean Museum of Modern Art is in the castle, as is the Museum of the Olives. Haut-de-Cagnes The village itself winds around the top of the hill below the castle. to one side is a large open area with a couple of cafes, while the remainder is a mix of narrow streets, houses painted in pastel shades, a small square of arcaded houses...it is quite compact but very pleasant to explore. There are also views out across to cagnes-sur-Mer and beyond. Elsewhere in Cagnes Musee Renoir One highlight of a visit is to the estate and museum at Collettes - Cagnes-sur-Mer was the last home of impressionist painter Renoir, and his estate can be visited, along with a collection of 11 of his paintings and some other works by well known artists in the Musee Renoir. Le Cros de Cagnes The other two parts of the village are the 'new town' at the foot of the hill; and the old fishing port (Le Cros de Cagnes). Fishing was the main industry in the village before tourism arrived. The port is now a good place to find a fish restaurant, as well as access to several kilometres of pebble beaches. Biot is a small town near Antibes, between Nice and Cannes, a little inland from the French Riviera. Despite its location, it is slightly off the main routes that cross the region and is much quieter than many of the towns in the area. The village is very pretty with quite an extensive old town lined with attractive houses and numerous small features to catch your attention. Park in the car parks concealed down the hillside (les bachettes) and enter Biot along the Rue Saint Sebastien - a broad boulevard lined with attractive colourful houses, cafes, and lots of greenery. The tourist office is halfway along this street. The old town is found at the far end of this road and contains many features and highlights to attract your attention as you explore. The centre of Biot old town is the Place des Arcades (a narrow square with arcaded houses along both sides and the 15th century church at the end - be sure to go in the church to see the retable (painting) of the Virgin of the Rosary by 16th century artist Louis Brea. As you explore the streets you will come to a small gap in the houses called the place de la Catastrophe - it was here in 1898 that three houses collapsed during a communion party killing 26 people. Be sure to ask for a map of the town at Biot Tourist Office: the map contains a wealth of fascinating information, and highlights many interesting architectural features that you might otherwise miss that all help bring the history of the town to life. Biot is also well known for: - its glass-blowing: there are many shops and workshops that will introduce you to the art - and sell you examples - Fernand Leger. There is a museum dedicated to the well known modern artist Fernand Leger on the edge of the town, with an interesting collection that shows you live and carrer of the painter as it developed over the earlier decades of the 20th century. The position of Biot means it qualifies as a Provencal perched village and it has the fortifications and entry gate that originally helped protect the town. Mougins is a hilltop village situated a few kilometres inland from Cannes in the direction of Grasse, in the Alpes-Maritimes department of Provence. It is another of the many picturesque medieval perched villages that are dotted across Provence, with a centre that is very pleasant to explore and a sprinkling of narrow cobbled alleys to stroll along, heading off from the village centre and its central fountain. You will discover various other fountains and statues as you explore, and numerous other small architectural highlights, both remnants from the past and more modern creations. The village has given a high priority to greenery, and there are many flowers, trees and pretty garden areas, all adding further to the charm and helping Mougins blend into the countryside. Indeed the combination of narrow streets along with the explosion of pots of plants and art galleries spreading into the alleys means you are sometimes positively hemmed in! The views from the village across this surrounding countryside and out across Cannes Bay are as impressive as the village itself - see the 'table d'orientation to help appreciate how much you can see from here. There are also many art galleries and restaurants and cafes in the town - even more than most of the perched villages of Provence, Mougins attracts the rich and famous who live hidden in the surrounding hills, and perhaps as a result the town is well known for its very impressive selection of high quality restaurants. Outside the circular spiral of streets that comprise Mougins old town there are broader streets containing cafes etc and views across the countryside to the Mediterranean Part of the reason why Mougins is so focussed on art is that Picasso spent the last years of his life (1961-1973) living just across the valley from Mougins, next to the Chapel Notre-Dame-de-Vie, and many other famous artists (and non-artists) have had homes here. Be sure to visit the Chapel - it's in a very attractive setting surrounded by the 'trademark' cypress trees of Provence. There is also a popular Photography Museum featuring photos of Picasso taken by André Villers (official photographer to Picasso) among others. Personal comment: Mougins is the only place I remember visiting where art galleries proudly display their paintings outside their shops and then put up a big sign saying 'Do NOT take photos of this shop or these paintings'! The city that has made its art an industry. Grasse was an active trading city in the Middle Ages and has managed to maintain its urban structure from this era. The old town’s architectural pattern, a snaking network of tiny alleys, leaves traces of successive extensions around the original summit called Le Puy, where the temporal and spiritual power centers - the cathedral, the Episcopal palace, and the towers - were erected. Though the town’s design is Provencal, one can find architectural influence from neighbouring Italian provinces such as Tuscany and particularly Liguria, with whom Grasse, allied to the Republic of Genoa, shared strong trading relations over five centuries. There is a lingering sobriety in Grasse’s architecture, left by the austere medieval Genoan façades, the Renaissance columned staircases, and the arched entryways of the private homes. The houses, which stood for many years between the city’s ramparts (destroyed in the 19th century), reached in height what they could not find in breadth, thus creating deep and encased roads. Menton's nickname is la perle de la France (the pearl of France), but it is much better known for its citrus. This town on the French Riviera is, like many other towns in the area, a beautiful combination of Mediterranean colors and architecture and French and Provencal culture, but Menton offers the added bonus of being the host of the annual Fete du Citron, Citrus Festival. Fete du Citron Menton's climate is perfect for growing citrus: the town has multiple lemon, tangerine and orange groves within its limits thanks to a peculiar microclimate that people say makes it the warmest spot on the whole Riviera. Every year in February, the fete du citron takes place, and each year the festival has a different theme: some more recent ones have been India and Disney. Preparations for the festival include exquisite decorations including sculptures made of citrus. The local cafes and bakeries get into the spirit by offering lemon and citrus-flavored delicacies to sample. The festival also features a parade through the city center. Gardens/span> If you happen to miss the festival, don't worry! There are still plenty of things to do in this beautiful coastal town. What with the bounty of the fete du citron, it's not surprising that Menton is famous for its gardens as well, particularly its exotic botanical garden, which boasts several varieties of exotic plants, trees and flowers. Another beautiful garden within the city limits is the Jardin Serre de la Madone, and several others dot the small city. Italian Like many cities on the Riviera, but perhaps even more than others, Menton is strongly influenced by its nearby neighbor of Italy. Menton is the last town on the French coast before the Italian border, and it was even a part of Italy in the 1940s, when it was captured by Italy and annexed until 1943. As such, Menton (much like its Italian counterpart, Ventimiglia), offers a combination of French and Italian cultures, and you are likely to hear both languages spoken around you as you wander the town. Beaches When people think Riviera, they often think of beaches. Within Menton are no fewer than six beaches, each of which is lined with boardwalks or promenades. On the boardwalks, there are several cafes and restaurants to eat in: many have outdoor terrace sections, some of which are actually located on the beach: a seascape instead of a centerpiece with your tarte au citron? Not too shabby.